This is not your typical banana bread. Although the ingredients may be the same, this recipe packs 5 bananas in the batter (and one for the top). 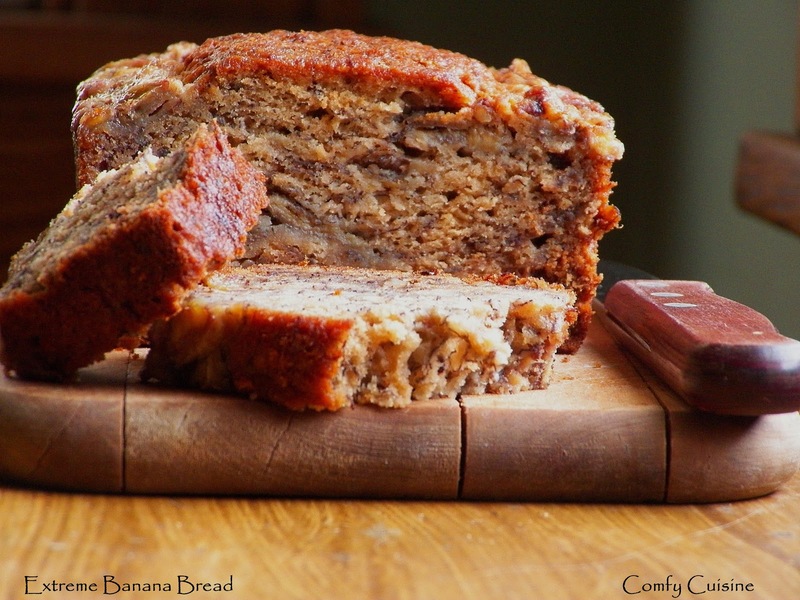 It's the best banana bread you will ever make. Adjust oven rack to middle position and preheat oven to 350 degrees F. Spray your loaf pan with nonstick cooking spray and set aside. Whisk flour, baking soda and salt together in a large bowl. Place 5 bananas in a microwave-safe bowl; cover with plastic wrap and cut steam vents with a knife. Microwave on high until bananas are soft and have released their juice, about 4-5 minutes. If you are using frozen bananas you can skip this step because thawed frozen bananas release liquid naturally. Transfer bananas to a strainer over a bowl and allow to drain, stirring occasionally. You should have 1/2 to 3/4 cup liquid. Transfer liquid to a medium saucepan and cook over medium-high heat until reduced to 1/4 cup, about 5 minutes. Stir reduced liquid into bananas and mash until fairly smooth. Whisk in butter, eggs, brown sugar and vanilla. Pour banana mixture into flour mixture and stir until just combined. Fold in walnuts. Scrape batter into prepared pan. Slice remaining banana and shingle slices on top of either side of loaf. Sprinkle granulated sugar evenly over loaf. Bake until toothpick comes out clean, 55 to 75 minutes. Cool on wire rack 15 minutes. Visit The Country Cook for Weekend Potluck! I agree - this is fancy! I bet the bananas on the side were delicious.